It’s up to the Changers to rescue their friend Mack from the enemy—but in order to do that, they must first break an ancient curse—in the seventh action-packed novel of The Hidden World of Changers series! Mack has abandoned his friends to join their enemy, the Shadow Fox. Gabriella wants to find Mack as soon as possible, but it’s too dangerous. The Changers need magical protection before they confront the Shadow Fox again. Luckily, the First Four have found a protection spell that will guard Darren against the Shadow Fox’s dark powers. There’s only one problem: The spell won’t work. Darren’s ancestors were cursed long ago during an ancient war, and the only way to enact the protection spell is to break the curse. To do that, Darren will have to find a descendent of the one who cursed his ancestor. 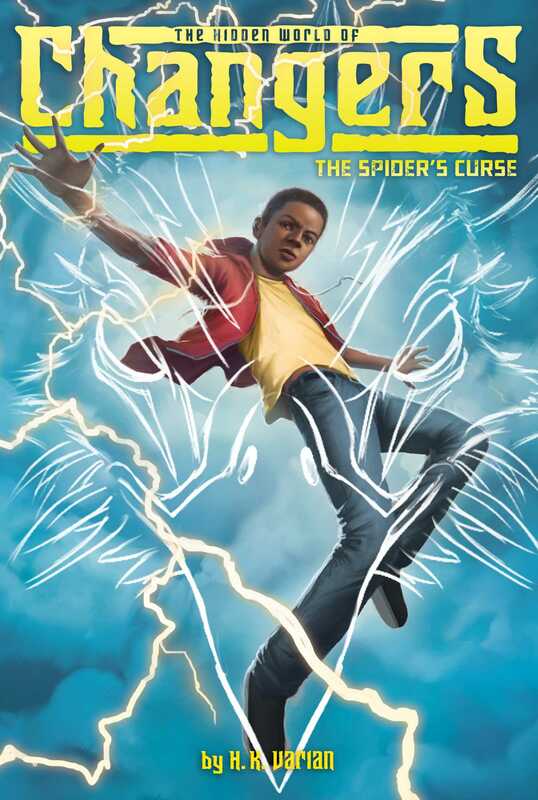 Will Darren be able to find someone to break the curse…or will he and his family suffer the Spider’s Curse for all time? Darren was stunned. They’d been searching for weeks for a talisman and had come up with nothing. If I have protection against Sakura, we can go back to doing what we should be doing anyway: searching for Mack and getting him away from the Shadow Fox before he earns another tail. “What is it?” Darren asked. “I’ll be ready,” Darren said. Darren knew Margaery. She was a tengu, a Japanese bird Changer. Unlike impundulus, who had the power to control lightning, tengus had power over the wind. They could use that power to transport anyone anywhere in the blink of an eye. “I’m afraid it won’t break the curse,” the professor answered. Darren had been so consumed with worries about Mack that he had nearly forgotten the startling news he had learned from Professor Zwane when he first visited Wyndemere Academy in the spring. He and his friends wouldn’t be able to attend Wyndemere until the ninth grade, but Darren and the others had visited the campus. Being on a campus full of people like him was the first time Darren didn’t feel like a total freak since he found out he was an impundulu. Exploring Wyndemere along with Fiona, Gabriella, and Mack had been a bright spot in a long and confusing school year. Then two things happened to dull that light: Sakura appeared and attacked Mack, and Darren found out his family was cursed. Darren had sat in on a lecture by Professor Zwane on West and South African mythology. He hoped to learn something about his own history and get a taste of high school classes at the same time. He was totally unprepared for what the professor told him after class. “From the minute you walked into my classroom, I could sense that your power too is bound by the Spider’s Curse,” Professor Zwane had told him. Darren was so shocked by the news that he could hardly form questions, but the professor, an impundulu himself, shared what he knew. In ancient times, before the Changer nation was established to prevent such things, there were sometimes wars between different magical factions. Usually, they had to do with establishing power over a particular area that was valuable for its resources or strategic for defense. A bitter conflict broke out between the spider Changers—sometimes called anansis after the West African trickster god—and the impundulus. The professor explained that during the conflict, the anansis cursed many impundulus with a powerful poison contained in their bite. The anansis’ poison can curse more than the individual impundulu they’ve bitten. The curse courses through the whole bloodline, passing down from generation to generation. There had been no clear winner before a truce was finally reached between the two factions, but many of the strongest impundulu bloodlines were cursed. The curse suppressed the Changer gift in younglings so that generations passed without anyone in that family ever presenting Changer powers . . . without ever knowing that they themselves might be Changers if the curse weren’t in place. Feelings were high on both sides after the truce. Most anansis had refused to lift the curse, so it continued to modern times, and the only way a person could get the curse lifted now was to find the descendant of the original anansi who’d cursed him or her and have the curse broken. Professor Zwane told him that Darren had descended from a once-cursed bloodline. For some reason, Darren’s magic was powerful enough to develop, despite the anansi curse. Things with Mack got out of control so fast, Darren thought. I never even told Gabriella and Fiona about the Spider’s Curse. Even so, the knowledge of the curse was always hovering in the back of Darren’s mind, like homework he’d put off until the last minute or a test he’d forgotten to study for. At first he hoped that if he found a way to break the curse, he might discover that someone else in his family was an impundulu. After all, Mack had his grandfather, Fiona had her mother, and even Gabriella’s aunt and grandmother were Changers. Darren longed for a family member to share his experience with. But today his first thought wasn’t about the possibility of Ray or his mother becoming an impundulu. His first thought was about Mack. Darren had just ended the call when he saw a movement, like a flicker, in the air. With a whoosh that ruffled the papers on his desk, Margaery landed in Darren’s room along with Gabriella and Fiona. Behind Fiona, Darren saw Gabriella flinch slightly. “Ready to go?” Margaery asked him, breaking the silence. The group disappeared as quickly as they had arrived, and Darren bounded down the stairs. He found his mother in the kitchen. His mother smiled at him. “You usually put that kind of thing off until the end of the summer,” she said. “Don’t worry, I won’t,” Darren said. He felt a bit guilty about the lie, but he couldn’t exactly tell his mother the truth. Bye, Mom. I’m going to travel by wind to a magical school for shape-shifters and learn how to protect myself from a crazed villain who wants to control my mind. Oh, and maybe I’ll even find out how to lift the curse our family has been living under for a thousand years. He made a mental note to get started for real on his summer book report as soon as he had the time. “I’ll pick you up around dinnertime?” his mother added. “Sounds good,” Darren answered with a nod. He headed outside and found the group in the backyard, under the tree that held his old tree house. Darren nodded. He put a hand on Margaery’s arm. Fiona and Gabriella did the same. There was another whoosh, and for a moment all Darren felt was stillness. Then the world flew by for two or three head-spinning seconds. They landed gently in the middle of the Wyndemere Academy campus. Darren blinked in the sunlight, then turned to the Gothic castle that served as the school’s academic building. Unlike the last time they were here, the grounds were empty and quiet—almost eerie, even in the brightness of the summer sun. Professor Zwane waited for them at the door of his office. Darren was surprised to see Sefu standing behind him. He was even more surprised to see the rest of the First Four inside. Each one of them was holding something. “What’s going on?” Darren asked. Fiona walked over to the papers on the professor’s desk. “What language is this?” she asked. Darren stifled a groan. He could tell that Fiona was about to ask another question about the ancient language, and Fiona’s intellectual curiosity would appeal to the professor. That could easily turn into a long discussion about the evolution of language, and Darren didn’t want to take the time for a lecture right now. He wanted to hear about the spell. Gabriella must have had the same thought. She jumped in before Fiona had the chance to ask another question. “This spell will protect Darren from Sakura?” Gabriella asked. She bounced on the balls of her feet the same way she did when she was on the soccer field, impatiently waiting for the ball. “This spell draws on the power of all of Darren’s ancestors to guard and protect him,” the professor said. “We think it will protect him from Sakura’s mind control,” Mr. Kimura added. Darren couldn’t help but see the sadness and worry in the man’s eyes. “So we can start looking for Mack again,” he said. Yara handed a jar of something terrible-smelling to Professor Zwane. “I have the blue whale’s milk you asked for,” she said. I hope she didn’t have to milk a whale, Darren thought. Sefu gave the professor what looked like a dried spice. “Red sand from the deserts of Babylon,” he said. Ms. Therian produced a rare savanna herb. Finally, Mr. Kimura handed the professor an ivory bowl covered in ancient runes. Darren had thought they were just going to learn about the spell. The idea of actually doing it was suddenly overwhelming. Like everything else in the Changer world, things were moving just a bit too fast for him. Are all of my ancestors going to appear? he wondered. Am I going to be surrounded by a bunch of impundulu ghosts? Sefu and Mr. Kimura led Gabriella and Fiona out of the room, and Darren was left alone with the professor. He took a deep breath. I hope my ancestors are friendly ghosts, he thought. The whale’s milk, sand, and herb were combined carefully in Mr. Kimura’s ivory bowl. The smell tickled Darren’s nose, and he had to stifle a laugh when he pictured himself sneezing all over his ghostly ancestors. Professor Zwane laid two pillows on the floor. He sat cross-legged on one and motioned for Darren to take the other. Then he placed the bowl between them, closed his eyes, and began to chant in a language Darren had never heard before. A warm glow began to emanate from the bowl. It grew to surround both Darren and the professor. Darren sat bathed in the light for a moment, feeling calm and supported. All his nervousness disappeared. Then he saw people all around him, ethereal and wreathed in light. Men and women were smiling and reaching for him, but nothing about them was frightening. Darren felt reassured in their presence. The spirits of my ancestors, he thought, here to protect me. Darren wondered if he should thank them but was afraid to break the spell. He closed his eyes and thought the words. When he reopened them, he saw his ancestors’ smiles begin to fade. One by one he watched the joy on their faces turn to worry. And then . . . suddenly nothing. Darren’s ancestors disappeared along with the warm glow. Professor Zwane opened his eyes. Darren saw concern etched on the professor’s face.